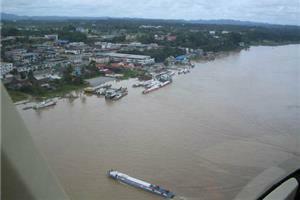 Marudi is a small riverside town in Northern Sarawak. 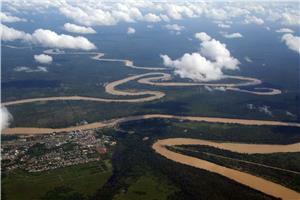 It is geographically located slightly inland from the prime Malaysian destination of Miri. It is also considered to be the primary cultural center for Malaysia’s own indigenous people, the Orang Ulu. In past times, Marudi was best recognized by tourists and world travelers as a standard stopping place between Miri and the major destination of Gunung Mulu National Park. However, the introduction of airports and other modern transportation options to the region have allowed Marudi to become a cultural destination in its own right. Today, visitors to Marudi and the surrounding regions come to learn more about Malaysia’s indigenous tribes and to experience some of the area’s most beautiful natural sights in person. The fact that it is less crowded and hectic than locations of similar size such as Kapit make it a desirable place to visit for travelers who like villages that are off the beaten track, despite being highly significant from a cultural standpoint. Marudi is especially popular as a side destination that makes a wonderful addition to a larger tour of the Malaysian nation on the whole. As is the case with much of Malaysia especially the smaller village and points of interest bus travel is an important transportation option that shouldn’t be overlooked. Bus travel to Marudi is not only convenient, as the city is well connected to other nearby cities of interest, but it’s highly economical as well. This makes Marudi bus travel a perfect pick for travelers looking to save their pennies however they can. Travel by bus to Marudi is also an economically sound option, so it’s a great choice for eco-conscious tourists as well. Explore the possibilities of Malaysian public transportation today and see what a difference it can make for you! For more information about Bus to Marudi, check out details from us today!